Chess enthusiasts looking to break out an ad-hoc game have a potential new option -Preset Chess. The board design is a travel-friendly size of 7.5” x 7.5” and draws design inspiration from mechanical pinsetters used in bowling. Fabricated from 100% Maple hardwood and hand-stained, the board contains individual compartments for each of the 32 pieces, allowing them to be stored upside down. 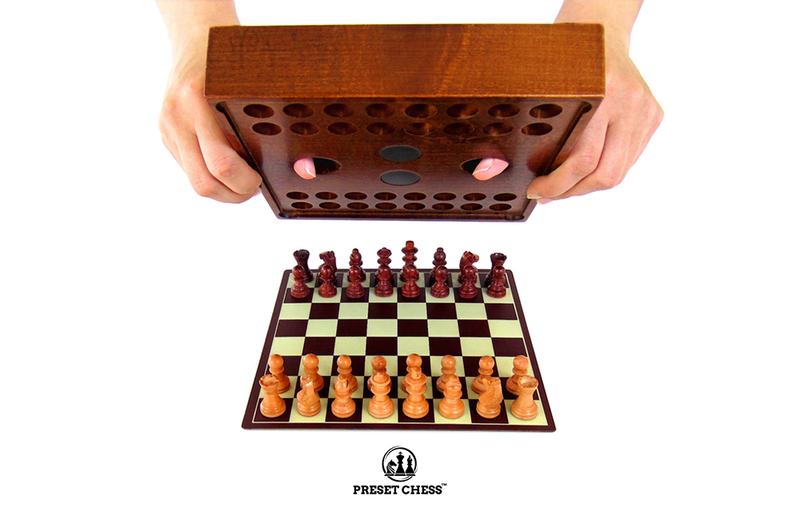 To start a new game, flipping the holder over releases the magnetically-locked chess board. This action also causes each of the magnetized chess pieces to stick to the board in their proper starting spots and virtually eliminates setup time. When a game is finished, each piece is stored back in its labeled compartment, awaiting the next“flip-and-play”. Preset Chess is currently available for pre-order on Kickstarter for a discounted price of $59 USD. Batman Classic Series Pin Mate Figures from Bif Bang Pow! With the Batman Classic TV series is marking its 50th anniversary this year, toy company Bif Bang Pow! is celebrating with a new collection of Pin Mate figures that pay homage to the show.